Philadelphia: March 27, 2017. 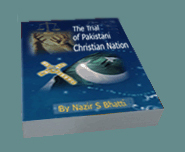 (PCP) Dr. Nazir S Bhatti, President of Pakistan Christian Congress PCC has said in a statement that Muttahida Qaumi Movement MQM Chief Altaf Hussain can seek support of Indian Prime Minister Modi under Liaquat-Nehru Pact for rights of Urdu Speaking Community in Pakistan as Muslim political leaders in Pakistan, Armed Forces of Pakistan and Prime Minister of Pakistan Mian Nawaz Sharif supports for rights on Muslims of Indian Kashmir. In 1950, Prime Minister of Pakistan Khan Liaquat Ali Khan and Prime Minister of India Mr. Nehru signed a treaty for protection of ethnic and religious minorities in India and Pakistan which is famous as “Liaquat-Nehu Pact” and both countries are signatory of this treaty. It is fact that not a single shot was fired on Sindh Rangers or other law enforcement agencies personals by any member of MQM under leadership of Altaf Hussain when large arms catch was recovered from Karachi and Hyderabad and blamed on MQM. On other hand thousands of soldiers and civilians were killed by terrorists in Pakistan but none was killed by MQM Altaf Hussain.